Irish medical students have a long and proud history of embarking on international health electives (IHEs) to broaden their experience in the developing world. Although there are many opinions in the literature about IHEs, there is a dearth of empirical research that explores the experience and the value of these experiences to medical students. Most students who participate in these IHEs from Irish medical schools are members of student IHE societies, which are entirely run by students themselves. There are varying levels of preparation and interaction with the medical schools in planning these experiences. This study explores the experiences of a sample of students who completed IHEs in 2012. This qualitative study used anonymized one-on-one interviews with medical students in Irish medical schools who completed IHEs to developing countries in 2012. Students were recruited using online noticeboards of student societies and e-mail. Purposive sampling was used to find students from different medical schools, some who had travelled with medical student IHE societies and others who had travelled independently. Seven male and seven female students participated. Interviews were conducted until saturation was reached. Data were then analyzed thematically. The main themes identified were the perceived benefits of IHEs, the difficulties experienced with the distribution of charitable donations, the emotional impact on the students of participating in the IHEs, awareness of scope of practice by students, and issues with the current structure of IHEs. The informal relationship that currently exists between student societies and the medical schools results in poor accountability and reporting requirements on IHEs. Clearer guidelines and identification of learning outcomes for students would be helpful. The findings are relevant to medical students internationally. There is a long history of medical students travelling to developing countries to further their understanding and experience of health care. In Ireland, where we have a long and proud history of medical missionaries going to low resource settings, medical students have been taking part in international health electives (IHEs) for over forty years. Five of the six medical schools in Ireland have medical student IHE groups or societies which organize students for the experience. These societies are run entirely by students themselves and membership of them is typically open to students in the third year of studies. Their main role is to help fundraise for donations to the IHE host institutions in developing countries. Most students who travel to low resource settings on IHEs are members of these societies, and a small number of others travel independently. In Ireland, there is a certain level of recognition of IHEs by medical schools, but there is a lack of consistency in the approach to them. Some medical schools offer elements of pre-departure training, while others formally recognize time spent away by awarding academic credit. IHEs tend to last three to four weeks. Students generally travel after completing third or fourth year of medical school. For some, they will not yet have entered the clinical years of medical training. Many visit hospitals or clinics that have previously hosted Irish IHE students. Preparations prior to embarking on IHE tend to be limited to fundraising and obtaining travel vaccinations. These are mainly arranged by the students themselves or their IHE groups. There is no formal register of students who go on IHE annually, so figures for the number of medical students who participate are estimates gathered from student IHE groups. Here in Ireland there are no specific guidelines on student conduct while on IHE; this compares with the UK where specific standards are set out by the General Medical Council (GMC) to advise students of appropriate behaviour while on elective. The employment of private companies who specialize in arranging IHEs for students is not common in Ireland. Following a review of the relevant literature it is understood IHEs are considered a very important part of undergraduate medical education and as an editorial in The Lancet explained: ‘Nothing else in the undergraduate curriculum is quite like it or could replace it. No other part of the course transforms students so rapidly and profoundly’. Authors such as Ackerman and O’Neill have extolled the virtues of using well-planned IHEs as a tool for teaching about caring for disadvantaged groups[3, 4]. Others have commented that while medical curricula and evaluation of these have been enhanced and developed over the years, IHEs have not been similarly placed under the microscope[5, 6]. A positive development in this field has been the publication of a report by the Working Group on Ethics Guidelines for Global Health Training (WEIGHT). These recommendations acknowledge the huge increase in interest in global health and IHEs in medical schools. The authors discuss the benefits of IHEs, but also note the possible difficulties that can arise due to these electives. Elit et al. conducted a qualitative study that highlighted some of the problems that can arise on IHEs. Students described having great difficulty in knowing who to try to help in the face of so much need and deprivation in developing countries. This left some of them feeling upset and deflated after their elective. Most other studies focus primarily on self-reported outcomes, such as improvements in clinical skills and cultural awareness[9, 10]. A lack of standardization in all aspects of the running of IHEs hampers comparisons between medical schools. What these types of evaluations do not consider are the wider issues for participating students. They do not capture the essence of what it means to be part of these often life-changing experiences. Factors such as how their experiences affect them while away and on their return, are often ignored. This study attempts to address this gap by undertaking a qualitative study with recent participants of IHEs and discusses their experiences in depth. By engaging in interviews with students and recording their experiences and insights, this study raises some issues for medical schools and establishes a platform for further research. One-on-one, semi-structured interviews were conducted in person to record the experiences of the participating students. A phenomenological approach was adopted. Approval was granted by the Research Ethics Committee of the Centre for Health Policy and Management and the Centre for Global Health, Trinity College, University of Dublin. The principal investigator (POD) contacted student groups in each of the medical schools to advertise for the research study on online noticeboards and on their student e-mail contact lists in order to recruit potential participants. Some of these groups were general medical student societies, and others were specific medical student IHE societies. The inclusion criteria for the research study were that each participant had to be a medical student attending a medical school in the Republic of Ireland who had undertaken an IHE in a hepatitis A endemic country in 2012. 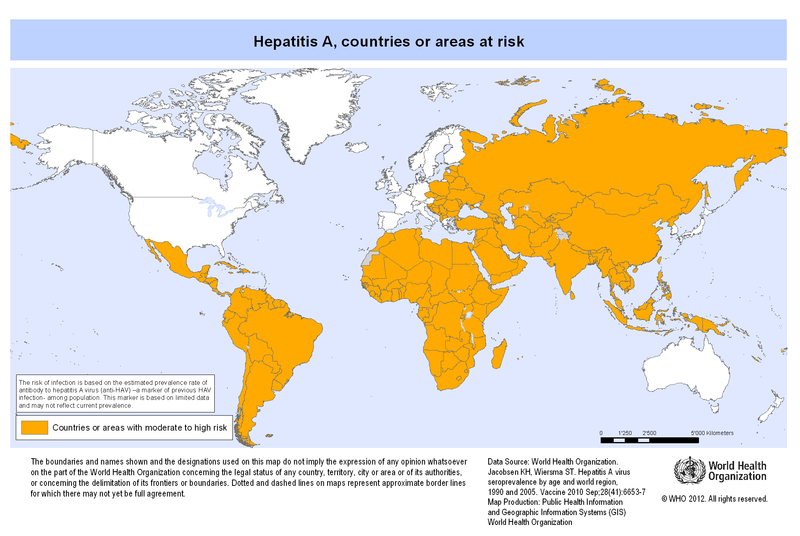 Endemic levels of hepatitis A infection have been used in the past as a marker for developing country status. The responses to the advertisement were screened and participants purposively selected and invited to participate in a qualitative interview. The screening was to ensure the inclusion criteria were met (that is they had travelled in 2012 and they had been in a suitable country), and also to discover what medical school the student was attending and whether they were part of a student group or travelled independently. The different medical schools in Ireland have different approaches to IHEs, with some offering basic preparation and others none. Medical student IHE groups do make some pre-departure arrangements, so it was felt that students inside and outside these groups should be included. Informed consent was gained from each participant. In the latter stages of the research project, snowball sampling was used to reach students from one medical school that had not yet been represented in the study. In the final study population there were seven male and seven female participants, with three who had entered medical school as postgraduates. Five of the six medical schools were represented. Two students travelled independently of student IHE groups. All of the participants had been on IHE in the summer of 2012. The research interviews took place in the summer of 2013, a year later. It was hoped this time lag would allow a period of reflection by the students who had been on IHE. The researcher himself had personal experience of undertaking three IHEs as a medical student. One of these trips was as part of a student IHE group, one was independently and the last was with a university charity with a focus other than health care. The status of the researcher as a qualified doctor and a postgraduate student of global health was made known to the participants prior to each interview, but it was made clear that he was conducting this study as an impartial researcher. An interview topic guide was utilized by the researcher. This covered the reasons for going on IHE, the expectations of the student, plans for before during and after the IHE, feelings on the IHE in hindsight and advice for future IHE participants. This was derived from the researcher’s own experiences of IHEs and a review of the relevant literature. Each interview was voice recorded. All information was anonymized during the transcription process. Thematic analysis was carried out as described by Braun and Clarke. NVivo (Version 10; QSR International Pty Ltd, Doncaster, Victoria, Australia) computer software was used to make the coding process more efficient. An audit trail of all coding, revisions and models of themes and subtheme arrangements was maintained so the research process was reliable and traceable[14, 15]. Interviews were conducted and analyzed sequentially until saturation was reached. Fourteen interviews were conducted from April to June 2013. Interviews lasted on average 55 minutes. Triangulation of data by having different researchers code the data was not possible due to time and resource constraints. Lincoln and Guba urged readers to consider the ‘transferability’ of qualitative research findings, and to be able to make that assessment in this case clear information on the study participants and setting has been provided. They also explained the concept of confirmability which is shown when the researcher involved acknowledges and ‘brackets’ their prior experience and knowledge of the topic under investigation. The researcher in this case was acutely aware of his experiences on IHEs from the outset. During analysis, equal attention was given to dissenting or differing viewpoints of participants in the data. The ‘COnsolidated criteria for REporting Qualitative studies’ (COREQ) was consulted to help formulate a concise report of this qualitative study. Five main themes emerged and these are presented in turn below. Others mentioned they had improved their communication skills, their clinical skills and that they now had experience with diseases that were previously unfamiliar to them. Some also complimented the standard of teaching received from medical staff in the host setting. As explained above, the majority of students taking part join IHE student societies. While these organizations have many roles in the running of IHEs, the major activity is fundraising. Much planning and organization goes in to raising the money for donation to the host clinics, but there is little direction on how to administer these funds once the students reach the developing country. The total amount raised by one student IHE society in the year being researched was €125,000, and this was then divided between the participants before departure. Behind all of these precautions was the issue of accountability; accountability to the student elective group at home, but also to the public who had so generously donated funds. A number of participants commented that the research interview for this study was the first opportunity they had had to discuss these troubling episodes. Some students had very firm boundaries with regards to carrying out activities beyond the scope of prior training. Others did carry out new activities and procedures with encouragement and supervision of host medical staff. This is the crux of the matter - does the developing world setting mean a medical student should take on more responsibility, especially if there are no other staff available? This is a complex issue and there was no consensus on the issue in the thematic analysis. The personal and academic benefits of IHEs reported by participants in this research study have been previously reported in the literature[18–20]. While some participants felt supervision was lacking at times, others encountered excellent medical teachers who devoted much time and energy to facilitating the visiting students. Difficulties with the distribution of charitable donations while on IHE have not been previously discussed in the literature. The creation of a benefactor-beneficiary relationship could negatively affect the successful learning experience. Current systems for the distribution of this money could be seen to reinforce historical inequities in developed-developing world relationships. Where students reported a lack of trust in host staff to manage any donations they brought on IHE, it is hard to see how they could have trusted the same staff to teach them medical knowledge and skills. Is the donation of funds a way of offsetting the time and effort spent facilitating and hosting the IHE students? Some of the participants in the research study seemed to feel that was the case. They explained that they felt happier when there was a ‘transaction’ taking place, one participant called it a ‘symbiotic relationship’ (P7). This does, however, risk creating dependence by the hosts on these donated funds. If medical students decide not to travel to a particular clinic or health facility on IHE, no money is donated, and this may pose serious problems for the running of the host hospital. Medical students do not have training or expertise in planning or managing projects in their own or other country’s health systems. They are often unaware of the many underlying issues that affect health systems in developing countries. Good health development practice would dictate the need for a full needs assessment before any visit and then shared planning of any improvements, with evaluation and monitoring taking place at every stage of the process. It would make sense, therefore, that students should focus on gaining knowledge and skills on IHE rather than spending their time assessing how donations should be spent. Ultimately, the issue of the sustainability of this type of erratic funding and the transparency of donations are issues for students, their IHE societies and their medical schools to address. If fundraising is to continue, perhaps the development of strong reciprocal arrangements with developing countrys’ medical schools would be a means of ensuring accountability and provide better educational encounters for students. The impact of IHE experiences on medical students has not been widely discussed. There are a number of papers describing the ethical dilemmas faced by students, but they do not tend to look at the effects these have on the students after their return home[22, 23]. In this study it is clear that some of the events experienced by students on IHE had a profound effect on them. P1 talked about ruminating on the case of a child he was unable to treat effectively: ‘I hope the kid is still alive, that I didn’t do harm, even though I wasn’t able to help them’. These examples highlight issues of ethics, the need for pre-departure training, and formal debriefing after the IHE is completed. The potential danger following troubling experiences like these is that if they are not discussed and reflected on in an effort to understand their root causes and outcomes, the student may be left with feelings of anger and dismay in relation to any or all attempts at improving health care in developing countries. Instead of the student returning from the IHE experience with a positive outlook on the possibility of improving global health and how this may be achieved, they may end up feeling disempowered with a very negative outlook. The research study participants had a variety of opinions on what boundaries should be set on their activities while on IHE. Most, if not all, made it clear they would not do anything without supervision or being taught and encouraged to carry out new procedures or roles. After that, there was a divergence of opinions, with some students happy to take on new responsibilities, while others strictly limited themselves to what they would be allowed to carry out in their home country. P1 highlighted this turmoil very well when he explained: ‘It’s a setting of such limited resources I guess, it changes how much a medical student should do and it’s either that or absolutely nothing at all’. There is no easy answer to this dilemma. If students had time and space to discuss such issues and how to deal with them prior to going on IHE, this would give them some direction and the confidence to decline opportunities to act outside of their scope of practice. Ideally, clear advice from medical school staff would also be available during and after the IHE has taken place. There also needs to be a discussion among students and their medical schools on the difference between a learning experience and a volunteering experience. A medical student should go on IHE primarily to learn, whereas a volunteer has a certain level of qualification or skill and can function fairly independently in the clinical setting. While student IHE societies are very keen to highlight their proud tradition of independence from the medical schools, some participants in this study had begun to realize that closer linkages with the medical schools for the conduct of safe and well-structured IHEs is likely to be in everyone’s best interest. While the student IHE groups carry out extensive preparation of the fundraising activities prior to departure, their disorganization and lack of any real contingency planning is notable. Despite the autonomous instincts of the students and their IHE groups, it would seem very sensible for medical schools to provide some basic level of pre-departure training, emergency planning and debriefing. Formalizing involvement of the medical schools may also allow for the running of IHEs to be more consistent and sustainable from year to year, as currently the committees of the student societies have little, if any, involvement with planning for the next year once they return to Ireland. There is much to be gained from IHEs, which can be truly worthwhile and formative experiences, but there is also the possibility of doing more harm than good. The proud history and enthusiasm for IHEs can lead to what one author referred to as a situation of ‘unexamined good intentions’ where it is presumed that this type of venture, with the aim of helping less fortunate people in distant parts of the world, is beyond scrutiny. The issue of charitable donations as part of IHEs has not been addressed previously in the relevant literature. The fact that inadequate preparation prior to IHE can lead students to placing themselves in distressing situations is obvious and should be addressed. Irish medical schools need to recognize the need for formal pre-departure training and debriefing on return, and their role in the governance of funds raised by their students. The possibility of formal agreements with institutions in several countries, with a view to developing long-term sustainable partnerships should be explored where regular short-term rotations for students and staff, and possible reciprocal arrangements could be arranged. The whole structure and planning of IHEs should be reviewed by medical schools with the aim of standardizing them to maximize the quality of learning experiences. Consideration should be given to developing formal education and training for the medical students on norms of professionalism, standards of practice, cultural competence, dealing with conflict, and personal safety. Working Group on Ethics Guidelines for Global Health Training. No funding was applied for or granted for the conduct of this research. Patrick O’Donnell, MB BCh BAO (Hons), DRCOG, DCH, MICGP, MSc (Global Health) is a clinical fellow in Social Inclusion at the Graduate Entry Medical School of University of Limerick, Ireland. He carried out this research for his MSc dissertation in Global Health at the Centre for Global Health, Trinity College. Eilish McAuliffe, BSc (Hons) (Psychology), MSc (Clinical Psychology), MBA, PhD is the Director and Associate Professor at the Centre for Global Health, Trinity College. Diarmuid O’Donovan, MD, MSc (Public Health), FFPHMI, DCH, DTM&H is a senior lecturer in Social and Preventive Medicine at National University of Ireland, Galway. He is also the Director of Public Health for the Irish Health Service Executive Western Region. The authors declared that they have no competing interest. No funding was sought or awarded for the conduct of this study. POD came up with the concept for this study following discussion with EMA. POD conducted a literature review and research proposal which were discussed with DOD and EMA: changes were then made. POD carried out the research interviews and analysis under the guidance of EMA and DOD. The final report and manuscript was written by POD and reviewed by EMA and DOD. All authors read and approved the final manuscript.